There are two things everyone should have on them for all occasions: a good pen and good notebook to go with it. You just never know when you will need to jot down a phone number, make note of an important piece of information from a conversation, or need to remember something for your job. But these EDC notebooks don’t need to be large, bulky legal pads or binders. And you don’t need college rule pages meant for a term paper or a novel’s rough draft. What you need is a hand-sized or pocket-sized notepad for writing quick notes and can be carried around easily. And fortunately for you, the market is full of EDC notebooks for all tastes. There are fashionable covers and minimalist covers. There are notebooks made for all weather conditions. They come with line paper, graph paper, and blank paper. There are notebooks for notetaking, list making, and sketch drawing or daily journaling. You can re-purpose almost any of them into your style. There are even models that can be refilled, so you only need to buy one and make it last. Here’s a list of the top Everyday Carry Notebooks. The best description I’ve seen for the Rhodia Staplebound is “simple and straightforward.” The simple cover looks both straightforward and professional. Inside the cover are 24 acid-free, graph-lined pages held together simply by two staples on the binding. “Field Notes” is perfect for those who need an EDC notebook for the outdoors. The Expedition Edition features weather proof paper, a dot grid style paper that is closer to plastic. It can stand up to rain, heat, cold, or whatever other conditions it’s exposed to. And the orange cover makes it easy to find should you misplace it. If you don’t need to write in all weather conditions, then the Field Notes brand also has a pitch black edition just for you. This all black edition has black on black covers, black staples, and grey-dot grid ruling on the paper. Another “weather proof” EDC notebook is the Rite in the Rain All-Weather Notebook. But while this model features the all-weather practicality of any all-weather notebook, its look is far more everyday than most all weather models. But don’t let the everyday look fool you. Inside the cover are 56 pages you can write on in the rain, wind, mud, or snow. Now, weather proof pages won’t prevent standard ink from smearing. So make sure you are writing in pencil or with weather proof ink when using “Rite in the Rain” in those conditions. Word Notebooks are designed for those who make regular use of to-do-lists. Word models feature 48 pages, each with bullet points on every line. Add it up and that’s potential for 96 to-do lists (and that’s 288 pages in a three pack). Word Notebooks also come in a variety of colors and instructions in the front cover for how to use their system. 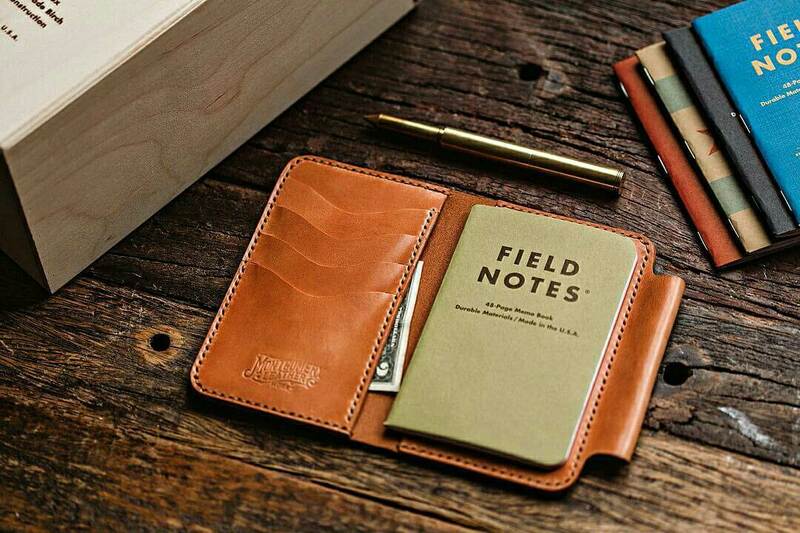 Field Notes features a tough packing brown wrap cover. You can also get notebooks with graph paper, lined paper, ruled paper, or a mixed pack with all three. They feature 48 pages with soy-based ink on the inside of that brown cover. These sturdy, stitch bound notebooks feature acid free paper that can handle any writing utensil. Public Supply Notebooks also come in a variety of colors and have a convenient space on the front cover for writing the subject of the notes on. And 25% of the profits Public Supply makes go to needy schools. Doane notebooks are a minimalist’s dream with its plain (though it does come it a variety of single colors) design. But its functionality is a definite plus as pages come equipped to handle both single line writing and graphing interchangeably. And Doane allows you to print a page of their paper off their website to see if you like it. The 48 pages inside Doane’s Notebooks are also made from 100% recycled materials. Moleskine features a black-textured cover on the outside and off-white paper on the inside. The binding is stitched for extra durability. And 16 of the pages are removable in case you need to share notes or just want to store away one set of your notes someplace else. Moleskines are also available in stores, so they can be replaced quickly. The Word Adventure Log was made with tourists and travelers in mind. These 48 page notebooks have spots for recording pertinent information for each day of your trip. The chart system on each page includes spaces for your location, date of visit, weather conditions, traveling companions, and other pertinent information regarding your visit. And since writing things down helps you better remember your adventures, the Word Adventure Log is perfect for recording and recalling your time traveling. There may not be a notebook with more features than the Leuchtturm1917. The 1917’s hard cover is great for those who want a durable hard cover. It has 8 removable, perforated sheets. It’s also an accordion style internal pocket for extra notes or receipts and stickers for labeling. The blank, acid free paper will not allow ink to bleed through. And an elastic band wraps around the front of the cover to keep the hard cover from opening. Leuchtturm also has a 1917 Dot Grid option. This edition has the durability (hard cover and elastic wrap around band) of the regular 1917, but it also has 185 dotted pages perfect for schematic drawings. This model also has numbered pages and a table of contents that you can fill in the front. The Mnesmoyne N192A features wire binding so the notepad can be laid down flat. The off-white paper is smooth. And a nice added feature is bold line every seventh line on each page. That line is an easy organizer for anybody using the N192A. The 3.03 by 5 inch notepad fits easily into your back pocket and only costs $3. This other Rhodia model comes in at 5.5 x 8.3 inches, a larger model than most everyday carry notebooks. The hard cover is great for durability. There’s also an elastic band to keep it closed and a ribbon bookmark so you can remember where you left off. The Webnotebook also comes equipped with 192 Clairefontaine grey-lined pages that work for pencil, ball-point pen, and calligraphy friendly fountain pens. There’s also an internal pocket for holding business cards and receipts. First Draft is the notebook for the minimalist that wants a little color on the cover, and it comes in a variety of colors. There are also more pages (224) available in First Draft than most notepads. The hard, durable cover and elastic band keeps the First Draft closed and protected. And that elastic band contains a loop to hold your favorite writing utensil. But be warned, you will have to provide your own writing utensil. The First Draft does not come with one. The first thing that sticks out about the Bull and Stash notebook is the unique and sleek leather cover. And the look of that leather cover will alter its look depending on the adventures you take it on. But the Bull and Stash is more than just stylish. Each notebook comes with 50 pages that are 60# and bleed resistant. And when you get finished with those pages, you can replace them with refills from Bull and Stash. Another leather notebook is the Ezra Arthur edition. And it comes in three shades (black, malbec, and whiskey). That leather is a high-grain Horween leather, and the notebooks are hand-stitched. And how about the 128 Tomoe river ultra-thin 52 GSM acid free, bleed resistant pages!!! There’s also a handy guide directing you on how to turn any page into either a line-ruled or grid-style graph ruled page. But what might be the most unique element of the Ezra Arthur is the method with which you can refill your notebook. First, for a small fee, you send your notebook to Ezra Arthur. Then, they will refill and rebind the notebook for you. After they are finished rebinding, they will send you back both your old pages and the notebook with the fresh pages.